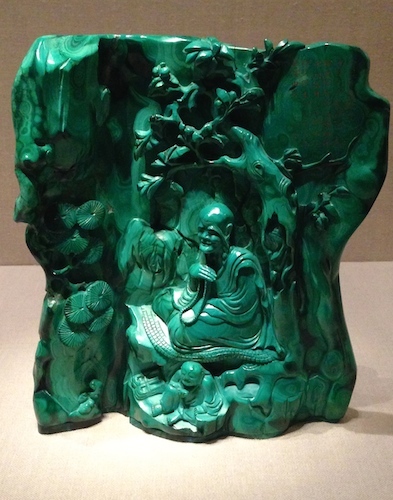 Converse had to have this tiny green malachite sculpture of a teacher seated in a grotto. The tiny show in the upper gallery at the far, far end of the Metropolitan Museum’s Asian Wing shows just how far two industrialists would go to collect eye-popping dazzlers from 18th and 19th century China. Colors of the Universe: Chinese Hardstone Carvings runs through October 9, 2017. 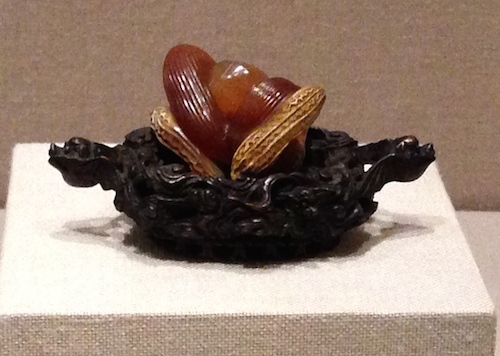 The curators want you to now that intricately carved and polished stones from China’s Qing Dynasty go way beyond green and white jade to the blacks, tans, reds, oranges, roses, and blues of a wide variety of stones available to the Chinese 18th and 19th century artisans — malachite, chalcedony, amethyst, coral, lapis, and carnelian. See them all lovingly displayed in Gallery 222. Look at our Flickr page, and check out other images in the Met’s photo gallery. If you can get to the Met, walk all the way to the end of the Asian wing on the Second Floor and take the stairs or elevator up. When we visited, there were no shortage of Asian tour groups filing through and snapping photos. The ancient art of Chinese stone carving reached its zenith during the Qing (1644-1911), known in movies and pop culture as the Manchu Dynasty. It was a time when emperors painted and wrote poems, the Peking opera was born, and culinary culture (tea ceremonies and gourmet dishes) rivaled today’s elevation of foodie culture. Scholars and the highly educated upper classes went to town outdoing one another with ink, paper, and acquisitions. 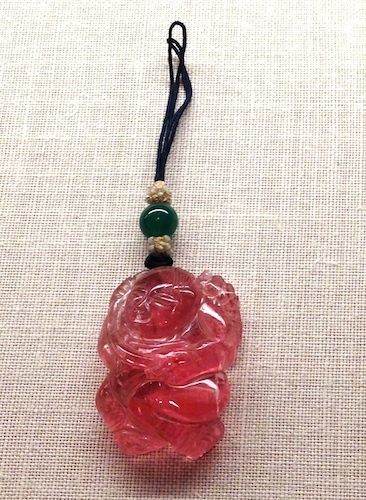 Qing craftsmen enjoyed lots of royal patronage, and any materials required to produce something fantastic – including colorful stones — were available. Although this show includes personal jewelry and a few carved pots and brushes used by high-end scholars, the focus is really on the “look at this” display pieces. These fantastic pieces were mostly acquired by two powerful industrialists of 19th century and early 20th century New York. Colorful miniature landscapes, lions, kids, fruits, vegetables, and seafood were irresistible. Several stunning pieces were bequeathed by Edmund Converse, an industrialist-collector who otherwise focused on big jade and European oil paintings. But even when his stuff went to the Met in 1921, the curators noted that the quality and delight of his assemblage of little colorful non-jade Chinese hardstones. But most of what you’ll see in Gallery 222 was collected and given to the Met by Heber Bishop, an industrialist who began in the Cuban sugar business in the 1860s, but later went on to many other industries (gas, iron, and railways) and was one of the backer-builders of New York’s Third Avenue El. 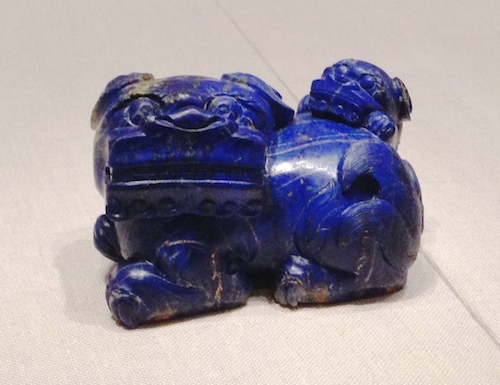 Bishop could not resist a tiny polished lapis lion with a little cub peeking out. It’s just over 2 inches high. Like many cultured gentlemen of his time, his passion for anthropology and collecting found its end-point in many NYC institutions. He went everywhere and bought everything, including vast amounts of Asian textiles, lacquers, bronzes, swords, and ironwork, but he was crazy for jade. Eventually his collection surpassed any of the jade collections of European museums, and he decided to make a big donation to the Met. Although there doesn’t seem to be any sign of it now, he made the donation on one condition – that the magnificent pieces be housed in a room that was an exact reproduction of his ballroom at home where it had been so lovingly housed. 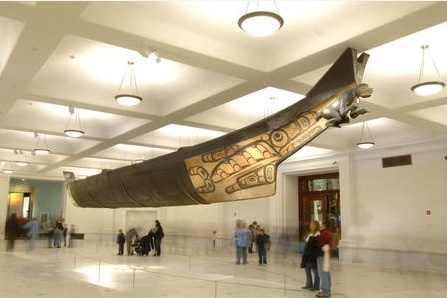 Who knows what became of that idea 100 years later, but we know that one of Bishop’s biggest buys did get it’s own room across town: Any day of the week at the American Museum of Natural History you can admire the spectacular 64-foot Haida canoe transported from Bella Bella, suspended in the recently spiffed-up Grand Gallery on AMNH’s First Floor. Although it’s wood, it’s carved from a single piece, just like his little Chinese stones. This entry was posted in Art, History, Museums and tagged arts, history, museums, nature, sculpture by mssusanb. Bookmark the permalink.